Chicken Stew to warm you this winter! I am not a winter person. I just keep counting the days until spring. I like making soups and stews during the winter, that seem to warm me up. This easy, one pot chicken stew is just one of those recipes. It fills the air with its cozy aroma and seems to snuggle me as I dip my crusty bread in it, and devour it. This chicken stew tastes good with both, bread and rice. So it could be a rice bowl with chicken stew too, just like the rice bowl with fish curry or the rice bowl with potato curry , all of them very different in tastes. So I rotate making all three! 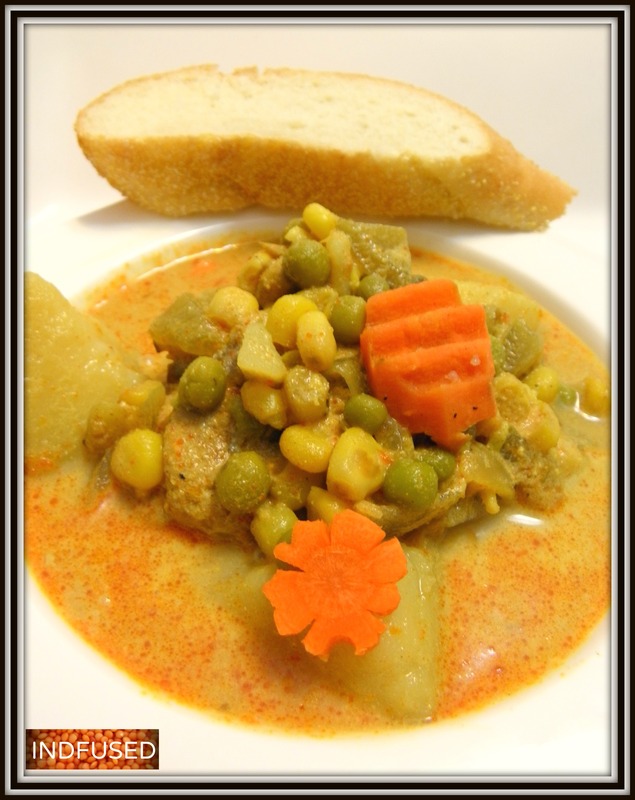 In this chicken stew, the chicken tenderloins and the potato, green peas , carrot and corn kernels, all cook together with the spices, so the flavors are all married harmoniously! The addition of coconut milk adds another healthy touch and gives it a delectable, creamy taste. 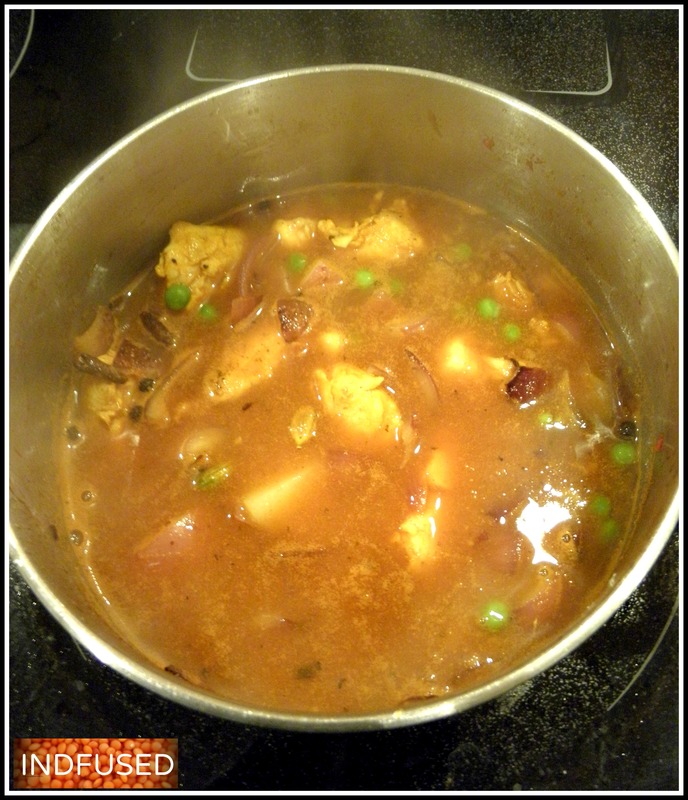 This mildly flavored stew is easy to put together and your one pot yummy meal cooks in under 15 minutes. Plus in the busy holiday season, this is a good make ahead meal as it reheats very well too. 3 breast tenderloins, about 1/2 pound total, cut into 1 to 1½ inch cubes. To the cut chicken pieces add the turmeric and chili powders, the extra virgin olive oil and 1/2 teaspoon salt. Set it aside. Meanwhile gather all the ingredients for the stew. Heat a 2 quart saucepan, over medium heat. Add the oil and butter, the peppercorns, cloves and the green cardamom pods. The spices will ‘swell up’ and be fragrant in just a few seconds. Add the diced onion and stir fry it until it is translucent with golden edges. 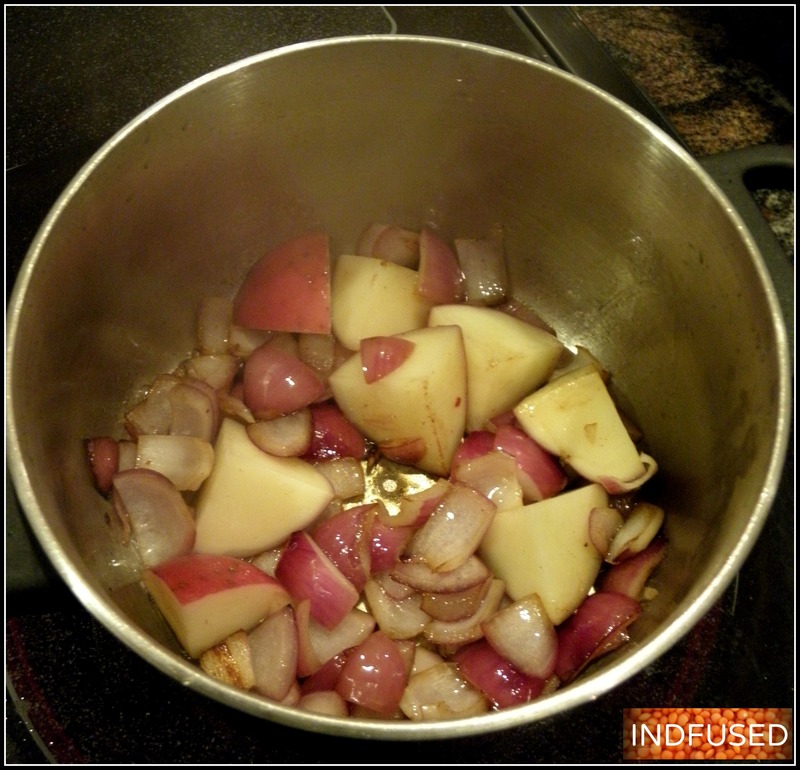 Add the ginger and garlic and stir for a few seconds to get the ‘raw’ smell out.Add the cubed potato and stir to coat it with the onion and spices. Stir for 1 minute. Add the marinated chicken, stir to coat it with the spice infused oil, for about 30 seconds or so. Add the tomato paste, stir well and add the petite peas, corn and carrot. Stir. Add 1 cup of water or stock and salt to taste. Let the mixture come to a boil. Chicken stew as it cooks! Reduce heat to low, cover the saucepan and let it cook until both the chicken and potato are cooked, about 10 minutes. Remove the lid, add the coconut milk mixture and let the stew simmer for another minute or so. Serve with crusty bread or over a bowl of rice! Yum! Hope the stew snuggles you and makes you feel warm and toasty this winter! Thank you so much Maria! Really appreciate the kind words. This looks like the perfect winter stew! Thank you so much Annie! I loved your post today and am drooling thinking of the young coconut water served in the café! My son and I were just counting the days until spring also. We calculated about 130 or so. oh my! Long way to go, right? Looks and sounds wonderful Sandhya! Thank you Madhu! I appreciate the kind words.